We’re excited to announce that we’ll be attending PC Gamer Weekender. Be sure to stop by the Olympia in London on the 17th – 18th February! This year, we’ve partnered with PC Gamer Weekender to present an all new Arcade section to the show. Be sure to stop by to play your favourite classic arcade games all for free! We’ll be bringing along a selection of our best machines including our top quality Bespoke Arcades range and budget-conscious GT range. 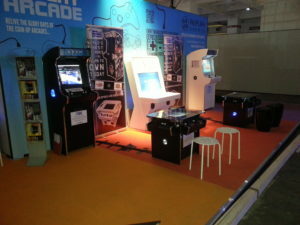 You’ll have a chance to play a variety of the best classic arcade games including Pac-Man, Street Fighter II, Space Invaders, Galaxian and many more. There will be something for everybody to play so make sure to stop by. For updates on shows that we’ll be attending this year be sure to follow our Twitter and Facebook pages. We always post all of the pictures we take from events over on our Pinterest boards. Should you have any questions regarding the show or our products be sure to get in touch via our website contact form.